Research needs to be explained clearly to others to colleagues, to educational bodies, and to the public by publications. There are various reasons for publication: 1- Publications help in spreading your knowledge and experience, 2- It gives you an academic profile and raises the profile of your institution, 3- Research publications create income for the University, ….. and 4- Publications strengthen your CV. Publishing a high quality paper in scientific journals is a halfway of receiving citation in the future. The rest of the way is advertising and disseminating the publications by using the proper “Research Tools”. Familiarity with the tools allows the researcher to increase his/her h-index in the short time. H-index shows the academicians influences in the specified field of research. Therefore, a person with higher level of h-index has more high quality publications with high amount of citations. 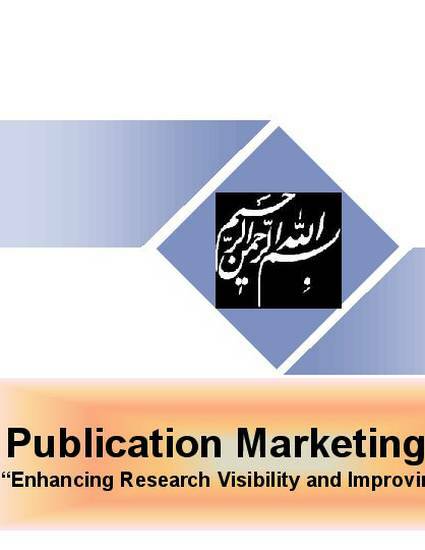 This presentation, covers the following topics: Why publish and increase h-index?, Definition of h-index and g-index, Importance of h-index, How to use “Research Tools” Mind Map, Paper title preparation, Selecting keywords, Select the proper journal, Advertise published article, and finally Trace published article citation.